Available Flip Cards depend on your User Role and the type of permissions given by your district. For example, if you do not have permission to create assessments, that Flip Card will not be available. In addition, each district decides which feature and functions to include in its SchoolCity Suite instance. Allows you to select the type of assessment you would like to create. Once you click on one of the options, such as Answer Key Only (AKO), you will navigate to the first step in creating that type of assessment. Provides a short cut to the most recently published assessments scheduled for paper administration. 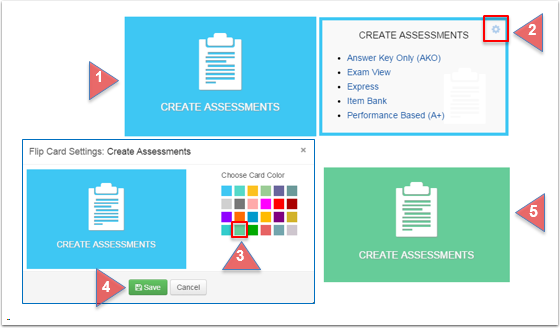 You can print answer sheets for AKO, Express, ExamView, and Item Bank assessments as set up during the assessment creation process. Allows you to schedule and monitor an online assessment, score online constructed response items, enter answers in Student Answer Sheet as a teacher user (AKO/Express Assessment), and view notes students made in the Student Portal during an online assessment. Provides quick links to all reports in the Report Manager. Click on a name to view that specific report for a selected assessment. 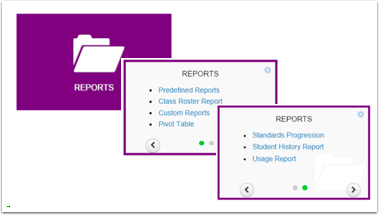 The Report Card module can be purchased separately by a district. If available, you can view, print, edit, and enter grades by student or by subject into a standards based report card. Allows users to add favorite links to commonly used websites and easily access them from within SchoolCity Suite. Similar to bookmarks or favorites in a browser, you can access these links from any device once you log in to SchoolCity Suite. To add links, click on the My Links Flip Card and on the flipped side, click on the gear icon at the top right corner. Next, click on Add New Link, enter the link title, copy/paste the URL, then click on Save. Allows District Admin Level Users to access all SchoolCity Suite Administrator functions including District Default Settings, Roles and Permissions, Users, and Templates. 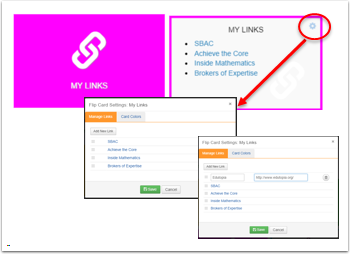 SchoolCity can add custom links to websites as requested by the District Administrator. Each district’s card will display with the district name and logo. 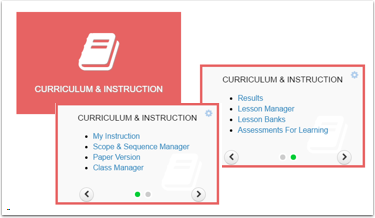 The Curriculum & Instruction module is designed for Teachers to easily deliver daily instruction in an electronic platform. Teachers can create custom lessons and organize delivery to match their pacing guides. 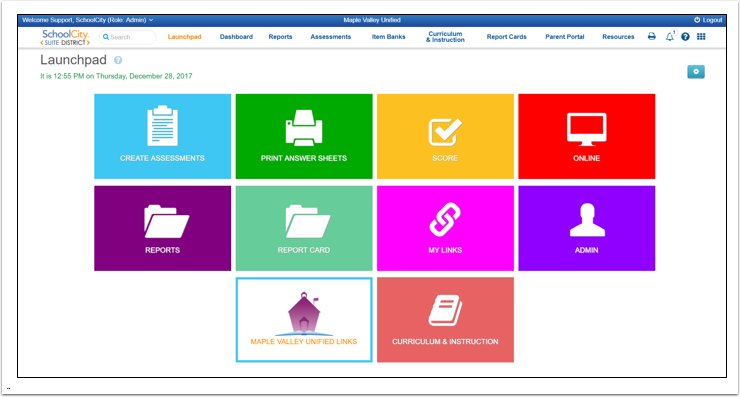 In addition, Assessments for Learning allow teachers to deliver formative assessments via the Student Portal and receive “real time” results. Choose the Flip Cards to display on the Launchpad. Click on the Gear icon in a blue box at the top right hand corner of the Launchpad. Check the box next to a Flip Card name to select or de-select it. A green check mark means the Flip Card will display. An open box means the Flip Card is an option available to you, but will not display unless selected. If the Flip Card is grayed out, it is not available for you to select. Click Save when you have made your selections. You may add and remove Flip Cards as often as desired. Click and drag to rearrange Flip Cards on the Launchpad. Left Click on a Flip Card. Holding down your cursor, drag the Flip Card to the desired location, then release. Customize the color of each Flip Card. Click on the card to flip to the reverse side. Click on the Gear icon in the top right corner of the card. The Flip Card Color Settings will display. Click on the desired card color from the color options. Click on Save to save the new color. The new color will now display on the face of the Flip Card.